Author Autar KawPosted on 18 Jul 2008 19 Jul 2008 Categories Integration, Numerical Errors, Numerical Methods, UncategorizedTags Trapezoidal rule, true error1 Comment on Is it just a coincidence – true error in multiple segment Trapezoidal rule gets approximately quartered as the number of segments is doubled? Can I use Trapezoidal rule to calculate an improper integral? For example, is an improper integral which can be calculated exactly as . Can we solve this integral by multiple segment Trapezoidal rule when we already know that the upper limit is infinity? But even for this integral we have issues as the integrand gives division by zero problems at t=0 (although the limit itself is zero at t=0). 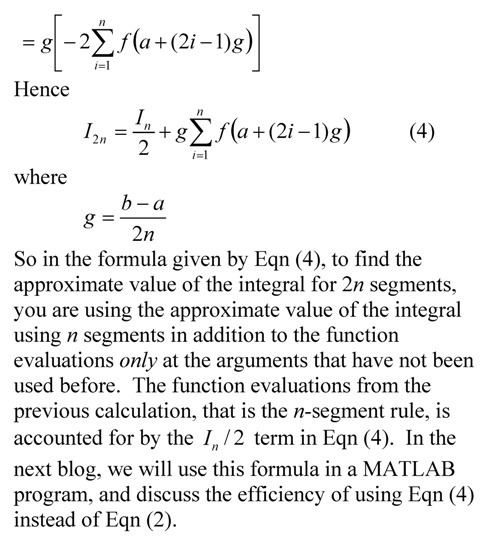 The MATLAB program that can be downloaded at http://numericalmethods.eng.usf.edu/blog/trapezoidal_improper.m (better to download it as the single quotes do not translate well with matlab editor) shows that we get accurate results for transformed integral with 256 segments. % rule to integrate exp(-x) from x=a to infinity, where a>0. Now someone may rightly point out that it works well because the limit of the integrand is zero at the lower limit of integration for the above mentioned integral. So go ahead, modify the program for doing this improper integral and see how well it works. In this case the integrand is singular at and one would have to assume the function to be a number other than infinity at for applying the multiple segment Trapezoidal rule. How many segments do you need to get an accurate answer for this integral? Author Autar KawPosted on 16 Jul 2008 14 Jul 2008 Categories Integration, Numerical Methods, UncategorizedTags improper integral, Trapezoidal rule3 Comments on Can I use Trapezoidal rule to calculate an improper integral?